Gurcharan Singh Tohra SGPC chief had gone to the Nirankari Samagam to appeal them for the votes, there he was honoured with 'siropa' and every Nirankari of Patiala knows it. 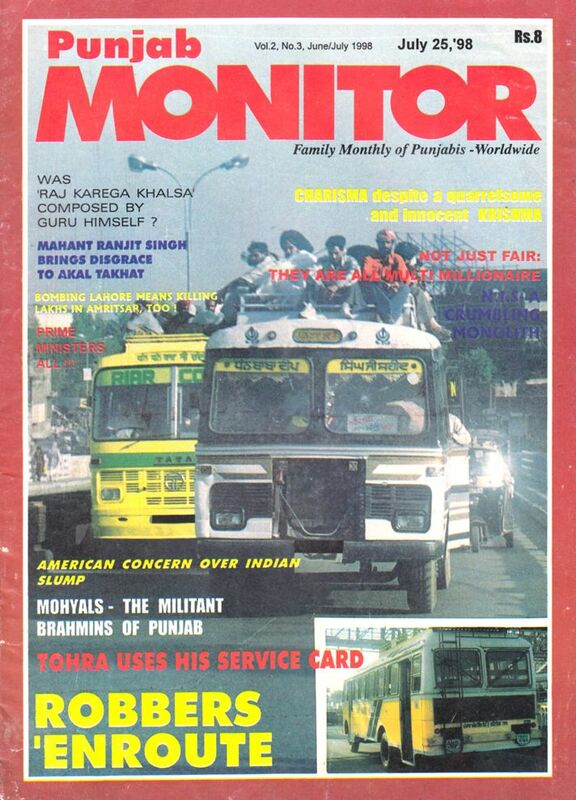 Captain Amrinder Singh brought the matter before Public as well as Akat Takhat chief. Tohra's ouster from the Presidentship of SGPC had become imminent. On the other hand Tohra had rendered highly valuable services to the governrnent during the last decade and the Congress regarded that these were in the national interest. When it had become clear that Amrinder's attack was too severe to withstand, Tohra approached the Congress High Command through the agencies. Amrinder was summoned at Delhi by the High Command to save Tohra. 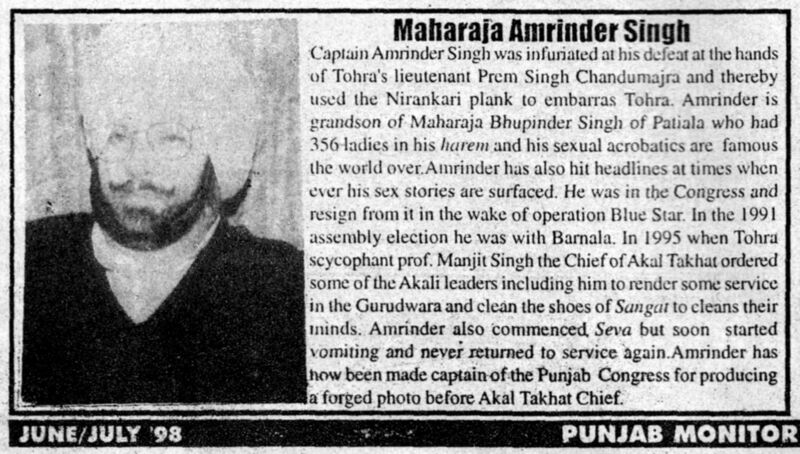 Amrinder forged the original photo deliberately and Presented it before the Akal Takhat . Some circles believe it was H.S. Surjit who saved Tohra but KHUSHWANT SINGH gives different theory based on his contacts with Congress circle to unravel the reasons how Tohra was rescued from the Akal Takhat. lt is Pursuance of the unfortunate Policy that the Congress, right from lndependence days, had promoted such Persons who rebelled against Sikh tenets. The examples of Baldev Singh, Pratap Singh Karion, Gaini Kartar Singh, Dr. Gopal Singh, Banta Singh, Giani Zail Singh, Beant Singh etc.c ould be cited. Persons like H.S. 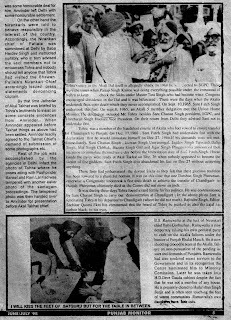 Brar and Mrs. Bhathat were ousted only because they would not readily attack Sikh institutions. It is a hard fact that at the time of election, politicians would stoop to any depth to secure votes. We learn from the inner circles of Congress in Delhi that Jathedar Tohra had gone to the Sant Nirankari Bhawan at Patiala where Nirankaris had gathered. 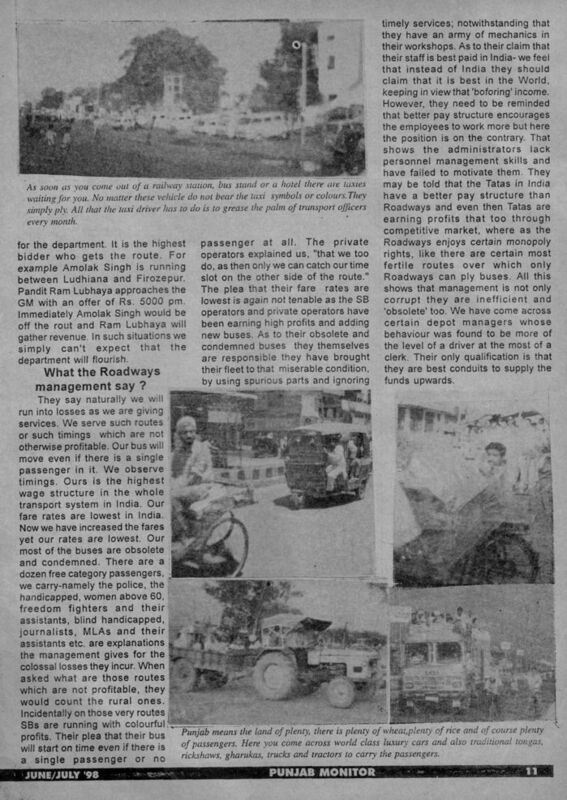 Naturally hundreds of Nirankaris had witnessed Jathedar Tohra's arrival and their joy knew no bounds as they were in fact witnessing an occasion when the head of SGPC the supreme Sikh body, who had last issued an edict the 'hukamnalna' on the boycott of the Nirankaris, was now at their feet. . On the other hand, when the results of election were over and Captain Amrinder Singh stood defeated and was studying the reasons. of his debacle, he was surprised to learn from a Congress worker that the Nirankaris had voted his for, Prem Singh Chandumajra. 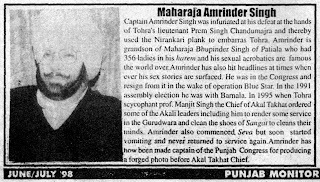 The Captain enquired howthe miracle haPPened, and he was informed that Tohra himself went to the 'Nirankari Bhawan to ask for votes and there he was honoured as well: The Captain lost no time in going to the press revealing all what happened at Nirankari Bhawan. Tohra, a seasoned leader who had weathered all adverse storms felt that the attack was too severe to withstand and his days as SGPC Presidant were thus numbered and those of the disgrace were to dawn in. His envoys lost no time and rushed to Delhi approaching the agencies through which he had been rendering secret service to the Congress. Amrinder thus Promptly surnmoned to Delhi by the Congress High Command. was some honourable deal for him. Amrinder left Delhi with some honourable settlement. On the other hand the Nirankaris were told to behave responsibly in the interest of the country. Accordingly, the Nirankari chief of Patiala was summoned at Delhi by Baba Hardev Singh and instructed suitably, who in turn advised the sect members not to embarrass Tohra and nobody should tell any one that Tohra had visited the Bhawan- Patiala's Nirankari Chief accordingly issued Press statements denouncing captain. By that time Jathedar of Akal Takhat was briefed by Tohra's leutinents to insist on some concrete evidences front Amrinder. When Amrinder appeared before Takhat things as above had been settled. Amrinder readily agreed to the Takhat Chief's demand of submission of some photograPhs etc. Rest of the job was accomplished by the agencies in Delhi. 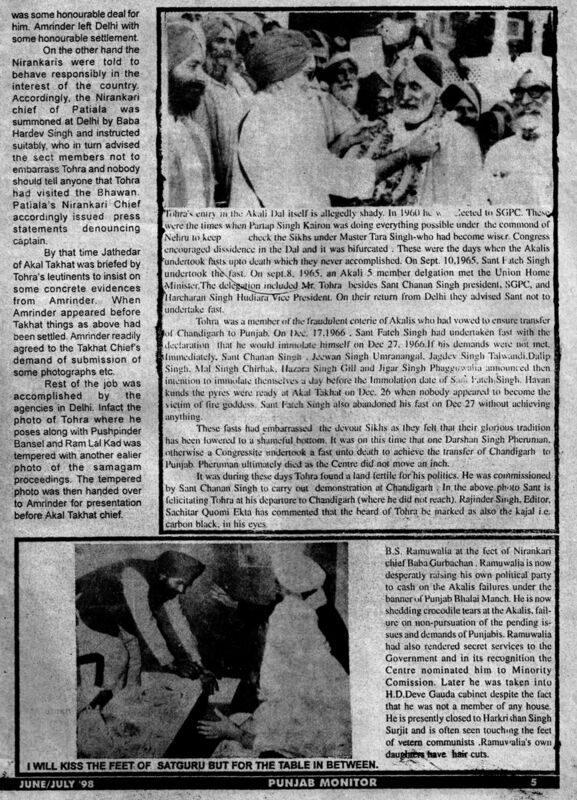 ln fact the photo of Tohra where he poses along with Pushpinder Bansal and Ram Lal Kad was tempered with another earlier photo of the samagam proceedings. The tempered photo was then handed over to Amrinder for Presentation before Akal Takhat chief.